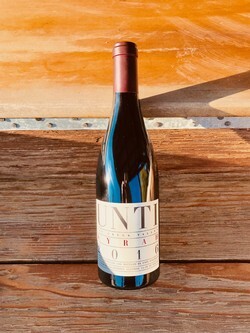 Unti is a true wine estate owned and operated by George and Mick Unti, who are irrationally committed to making European-style wines from Mediterranean grape varieties in Dry Creek Valley. This 2016 Syrah really illustrates the best attributes of this excellent vintage. It is dark, with intense blue and blackberry fruit, licorice, and spice. Syrah from of our favorite Crozes-Hermitage and St.-Joseph wines from the Northern Rhône. It comes from three blocks planted to four clones of Syrah located on the winery property. For those of you scoring at home the clones are 174, 877, 383, and our original selection obtained from Durell in Sonoma). 80% Grenache, 10% Syrah, 10% Mourvedre. 2015 is one of our most successful vintages across the board for Unti. Yields were low thanks to smaller clusters and berries which was probably the result of 2015 being the third consecutive drought year. This 2015 Grenache is a great example of the pretty side of Grenache based reds. The ripe vintage packs this wine with intense aromas of pepper, raspberry, cherry, blackberry, tar, licorice, and dried herbs. Our 2015 Grenache has plenty of body and texture, with undeniable tension between fruit and spice. We began grafting vines over to Montepulciano in 2005 after visiting Italy’s Le Marche Region. We now have 2.5 acres of Montepulciano planted to four different blocks on our winery ranch. This wine comes primarily from our oldest block planted near the creek and our 2-acre block planted in 2007. 2016 is a spectacular vintage for this Central Italian grape. The 2016 Montepulciano confirms our belief that we can make serious, full-bodied Montepulciano here in Dry Creek Valley. It shows classic black color, pure intense fruit (cassis, cherry and chocolate) with a lush yet structured mouth feel. Amazing that a wine this full-bodied can retain nice acidity. Fiano is perhaps Southern Italy’s most noble grape. This is only our sixth vintage making Fiano from .81 acres we grafted over in 2011. We prefer fermenting and aging our whites in concrete because it provides some texture without the oak character derived from barrels. We prevented this wine from going through malo-lactic fermentation to maintain bright acidity. This 2017 shows why we planted Fiano in the first place. Its pale-gold color leads to a dry, crisp wine that has incredible texture.